Taiji Pole was active from Early 2005 until 2007. They released a s/t CD in May of 2006. 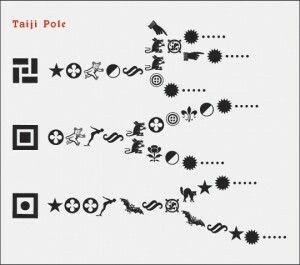 Taiji Pole’s music is based on continuous low-volume feedback which is meant to be felt as much as heard. While the instruments lose their individual identities the listener must deal with layers upon layers of tones, which are not guided by traditional rhythmic devises. The sounds are completely organic, feeling as if they are varying noises found in nature being combined into one new conglomerate. Shimmering, arching structures of feedback interweave into an intrinsic and meditative sound. It is a completely visceral experience where the body is integrated into the music and the universes vibrations all manifest into a greater consciousness. J.A. “Dino” Deane (uniflute) is an experienced improvisational and experimental artist, composer, and sound designer. He has appeared in a wide range of recordings, from Ike & Tina Turner to Brian Eno to Jon Hassell to John Zorn to Butch Morris. Carlos Santistevan (upright electric bass) is a self taught musician, High Mayhem Program Director, a recording engineer, and record producer. He is a member of the music ensembles The Late Severa Wires, Out of Context, A. Barnhouse, The Uninvited Guests, Green Orbit, PUSH PUSH, and others. Matt Deason (electric bass) has played for indie space rockers SpaceTeamElectra, Antelope, and the drum-n-bass outfit Cocktail Revolution. He has performed and recorded with Rick Allen (Def Leppard), Damon Wood (James Brown), and Brian Nevin (Big Head Todd).